Today’s multi-device, multi-platform path to purchase is dotted with complex touchpoints—and consumers’ expectations are greater than ever, especially for your brand. 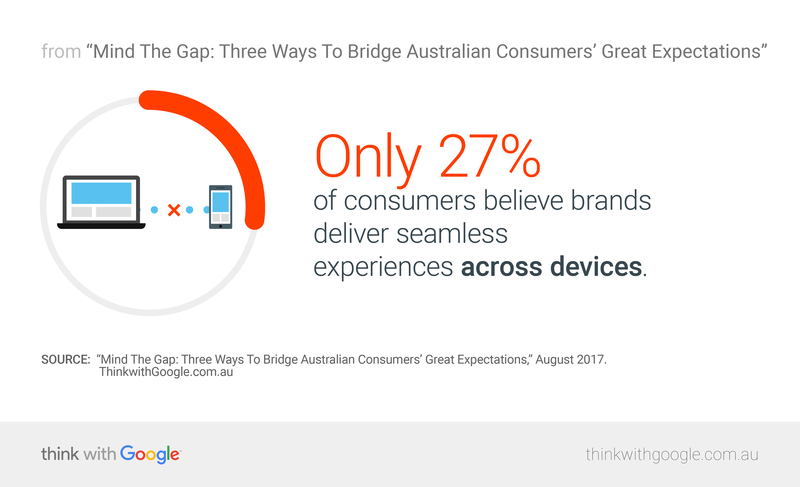 At Think 2020 in Sydney, Google’s Nick Love and Melanie Silva discussed how brands can meet these high expectations. Brands, take note: You are no longer defined by your positioning or your platform, but by your role in people’s lives. Every time people interact with a brand, they expect much more than simply being able to access the information they need—they expect quick, seamless, and personalised experiences. When people’s most detailed preferences are remembered on a travel consolidator website, or when they can pay for food delivery (and tip) with a couple of taps, or when they can order a rainbow fidget spinner for their kids on an aerobridge before boarding a flight and it arrives 17 hours later, they start to expect those experiences everywhere else. Brands tend to innovate by thinking first about what technology they can create or what they can put on a platform rather than defining the experience from a consumer’s POV. To shift the paradigm, brands need to solve for (and organise their teams around) consumers, not channels. To be able to do this, brands will need to really know their consumers. You probably have reams of data on hand that teach you some things about your consumers. But most brands still look at internal data, external data, and intent signals in silos. When all that data is looked at together, brands can gain amazing insights into your consumer’s context. And that’s where technology like machine learning can help. It can take into account all the insights about consumer intent and context—and do it in real-time. Looking at your data holistically will help in the crucial first step of nailing down who your most valuable consumers are based on things like lifetime value. Then instead of focusing on one-time sales or cost-per metrics, you can work on creating the best experiences for them (which will drive results over time)—and searching for more consumers like them. 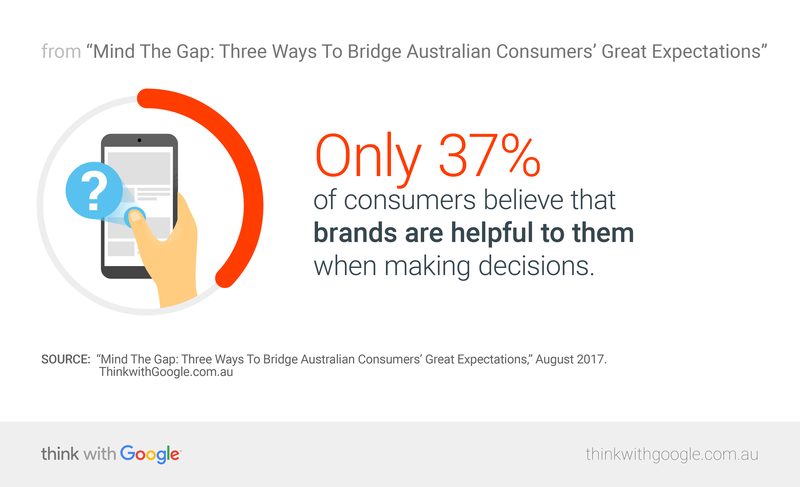 Once you have a better understanding of who your consumers (and potential consumers) are, how can you start bridging this gap and providing great experiences? It’s all about providing more value for people by being relevant, seamless, and fast. 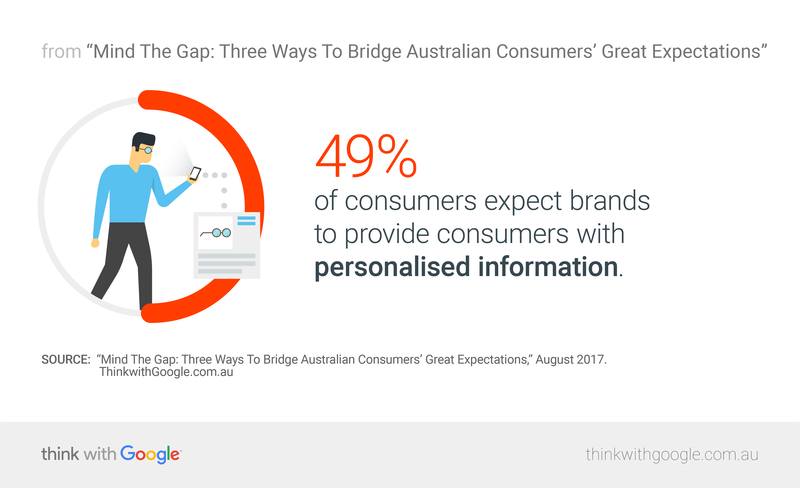 Nearly half (49%) of Australian consumers expect brands to provide personalised information.2 To do this, brands need to be able to predict why a potential consumer is visiting the site, store, social handles, or YouTube channel. Look for clues in previous search queries—what someone did on a previous visit. Think about how you can fold in what you know about a consumer’s context. If a consumer is on a laptop looking for restaurants, for example, they probably want to peruse a menu or a make a reservation. If they’re on mobile and looking for restaurants, they’re more likely looking for directions. Try to make recommendations based on what you might know about a consumer. A good example of a brand that smartly leveraged intent and contextual signals is Australia’s Origin Energy. Instead of waiting to serve TrueView ads to people who are searching specifically for new energy providers, the company used contextual signals (through YouTube’s Life Events targeting) to identify and reach people who were in the early stages of moving house. That gap exists largely because many companies are still overvaluing last clicks. The purchase journey is long and winding, and there are many more moments and interactions that assist in the sale beyond the last click. Use measurement and performance tools that allow you to track interactions across devices—then you can find ways to be present in the moments your consumers care about, not necessarily the ones your brands cares about. A good example is measuring what gets someone to visit your store. Among smartphone users who bought something in a store, 70% first turned to their devices for information relevant to that purchase. Powerful analytics and tools like store visits can help your brand get a more complete view of which tactics are driving which outcomes. The other crucial component is structuring your team around the consumer. Being able to value all interactions across the consumer journey comes when you break down team silos and create incentives for the whole organisation to work together. Having different KPIs for different teams can cause internal conflict and misaligned investment priorities. Australia’s Rebel is a brand that did this right. The whole organisation aligned around one KPI: store visit conversions. Focusing efforts around one objective allowed the brand to measure (and then optimise) the full impact of its online marketing efforts, leading to a 15% boost in profits. Last up: speed. In short, Australians have no patience for slow page load times. 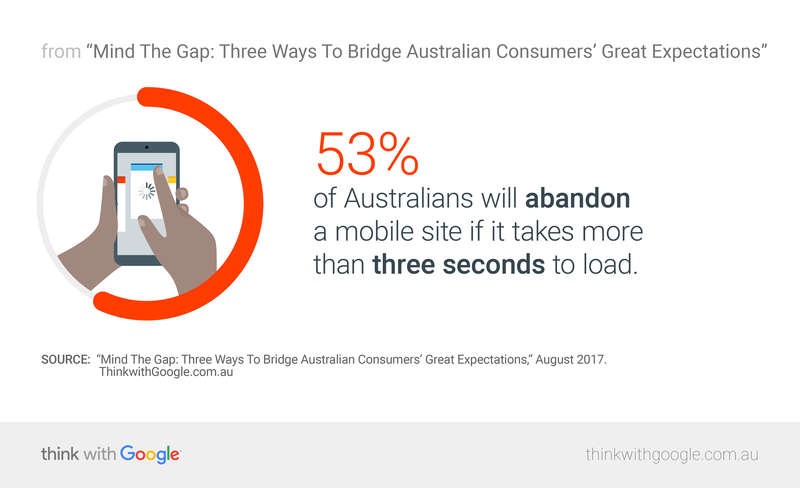 Over half (53%) will abandon a mobile site if it takes more than three seconds to load—and another 20% drop off for every second of delay.3 Truly, every second counts. Consumers will move on quickly if they can’t get what they need, which is why 58% of consumers expect brands to invest in technologies that make their mobile sites faster. Australia’s Open Colleges recently redesigned its website for faster load times and more streamlined experiences (including a simplified mobile homepage), and saw a 167% increase in conversion rate on mobile landing pages. Accelerated Mobile Pages (AMP) reduces friction on mobile pages. Progressive Web Apps give people an app-like experience in a mobile web browser. Take an honest audit of all your brand communications and ask: Are you helpful across key touch points in the consumer journey? Are you using data intelligently to empathize with and target consumers? Are you innovating, iterating, and re-structuring with fast, seamless user experiences that really matter? We can’t underestimate the challenges of the moment—or the opportunities. Brands that can work toward a more in-depth understanding of the consumer, continually innovate, and push for better consumer experiences are the ones that will win the day. 1 Google/Purchased, “How Brand Experiences Inspire Consumer Action,” April 2017, U.S., n=2010 smartphone owners 18+. 2 Google/TNS, “The Consumer’s Rising Expectations,” May 2017, Australia, n=2500 smartphone internet users. 3 Google Internal Data, 2016, Global.